Just 15 minutes far from the city center there is a unique summer swimming pool with real palms, salty water, 1st grounded lighthouse in Slovakia and restaurant with elements of Mediterranean architecture. Swimming season starts in June and finishes at the beggining of September. Opening hours are from 10am till 7pm (during July and August we start from 9am) For those who like romantic nightswimming, there are several Fridays (when the weather is good), which we announce in advance. Prices for adults for whole day are 7€/10€ (week/weekend). During your stay, you can play tennis or beach volley, relax in masage room or on the beach, watch the surroundings of Prešov through proffesional binocular from the lighthouse and try favourite services in MOLO Cocktail bar or Pizzeria. For kids there is a Children´s paradise - a place with children atractions and trampoline as well as children´s swimming pool. All year through is open a restaurant with bowling and the place is also suitable for weddings, family celebrations, company parties and so on. How to get here: Take a trolley bus nr. 1 from the city center (bus stop Na Hlavnej or Trojica) in direction "Solivar" and approximately after 13 minutes get off at bus stop "Šport". You need to go back 150 meters and than turn right into Kutuzovova street. You will reach Plaza Beach resort after 300 meters. Outdoor Park is the best place for finding an adrenalin excitement in Prešov. It is one of the biggest climbing options in region! You can choose between two circuits - small with 5 hurdles and big with 10 hurdles. Except this circuits you can add another adrenalin hurdles too. Outdoor Park is open usually from 9am to 6pm (cafe is open longer) in summer. Try to make a reservation before to be sure that they are not busy. Even if you are not a fan of this sport, you can make a stop while you are cycling along the Torysa river and drink your beer or cafe in a cozy cafe in Outdoor Park. How to get here: Take a trolley bus nr. 8 or 4 from the city center (bus stop Na Hlavnej or Trojica) in direction "Sídlisko III" and approximately after 11 minutes get off at bus stop "Centrum". You have to walk 50 meters along the main road (Prostějovská street) and than turn right onto Tomášikova street. At the end of Tomášikova street (after 400 m) you will see a building with chimneys - a boiler house at your right side. Outdoor Park is just behind this building. 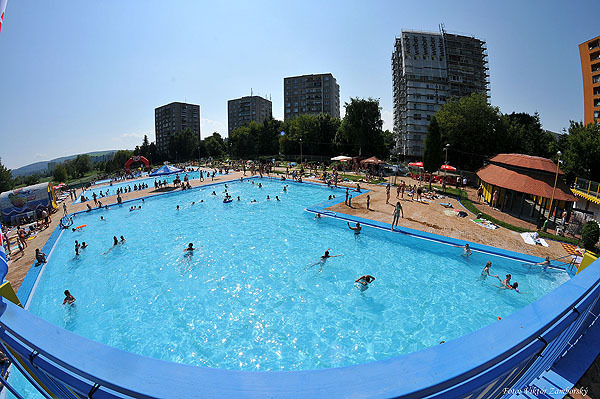 The swimming pool is a part of elementary school "Mirka Nešpora" so it is open only from September to June. Opening hours are irregular and you should to check it on their website. The pool is 25 meters long with 5 tracks, water depth is from 1,1 m to 1,3 m.
How to get here: Take a trolley bus nr. 8 or 4 from the city center (bus stop Na Hlavnej or Trojica) in direction "Sídlisko III" and approximately after 11 minutes get off at bus stop "Centrum". You have to walk 270 meters backwards along the main road (Prostějovská street) and than turn right onto Mirka Nešpora street. After 170 meters you will reach an elementary school on your left hand where is the pool. There are two pools for children, one for swimmers and one shallow pool. In the precinct there are many attractions, for example a climbing wall, trampoline or 3 beach volleyball courts. After 15:00 the entry is cheaper. How to get here: Take a trolley bus nr. 8 or 4 from the city center (bus stop Na Hlavnej or Trojica) in direction "Sídlisko III" and approximately after 11 minutes get off at bus stop "Centrum". You have to walk 150 meters backwards along the main road (Prostějovská street) and than turn left onto Antona Prídavku street. After 400 meters of following the main road turn right between block of flats. The entrance to swimming pool is just between street numbers 28 and 30. 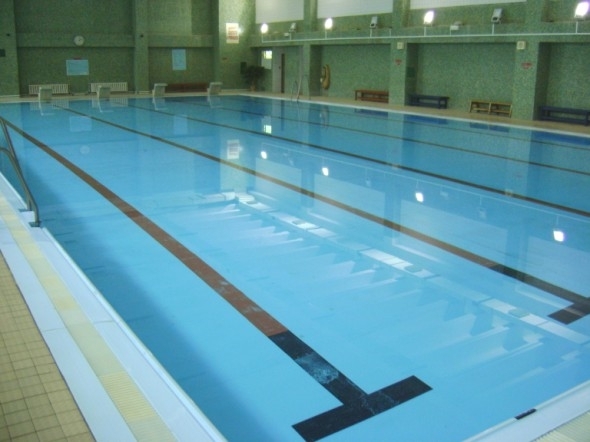 In the aquaparc you will find a 25 meters long swimming pool with cold water, unsafe slide for your back, lukewarm water in the main pool and some saunas too. Although it looks very nice in the picture, we personally haven´t had good feeling there. Think twice if you want to buy a whole day ticket, because you can get bored very quickly. - if you want to visit saunas too, you need to buy another ticket! For the exact prices ask at the reception. How to get here: Take a bus nr. 45 from the city center (bus stop Na Hlavnej or Trojica) in direction "Delňa" and approximately after 15 minutes get off at the terminal station "Delňa". You will see aquaparc just in front of you. 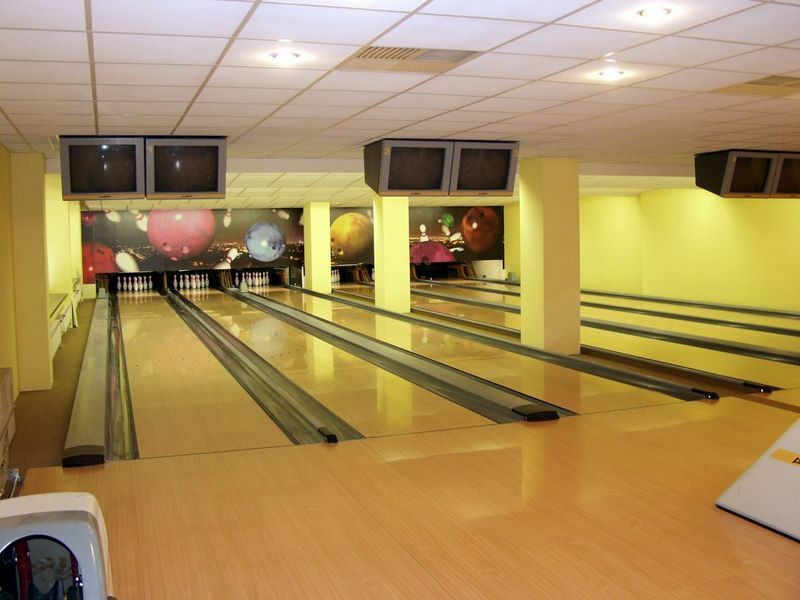 In the hotel Lineas you will find also 6 professional bowling alleys. How to get here: Take a trolley bus nr. 5 from the city center (bus stop Na Hlavnej or Trojica) in direction "Budovateľská" and approximately after 5 minutes get off at the bus stop "Štúrová". Cross the street and you are in front of the hotel. If you like a game frisbee (flying disc), you can play it in a small park directly in the heart of Prešov or if you need a bigger area, just go to another park called "Záhrada umenia" (Garden of Art) at the end of Svätopluková street (click here for a map). This garden is a perfect place for playing pétanque as well! There are more artificial playing areas in Prešov. Usually people play there a soccer or basketball. You can find there an athletic circle too. A smaller one you can reach from the city center with the bus 22 or 44 direction "Šidlovec" and you need to get off at bus stop "Stavbárska", which is directly at the playground (click for a map). If you want to use a soft athletic surface just take a trolleybus 4 or 8 direction "Sídlisko III" from the city center and get off at bus stop "Centrum". You have to walk 50 meters along the main road (Prostějovská street) and than turn right onto Tomášikova street. After 180 meters you will see on your left side orange athletic circle. Take a bus nr. 18 from the city center (Hlavná ulica) in direction Bzenov. After 15 minutes get off at bus stop Zabíjaná (request stop). There are four circles with the distance of 20 kilometers (together).